That is what we were on today - a wild goose chase. If I want to be a contender in the Billing's Big Year contest, then I have to go look at birds that I would normally not drive out of my way to see. 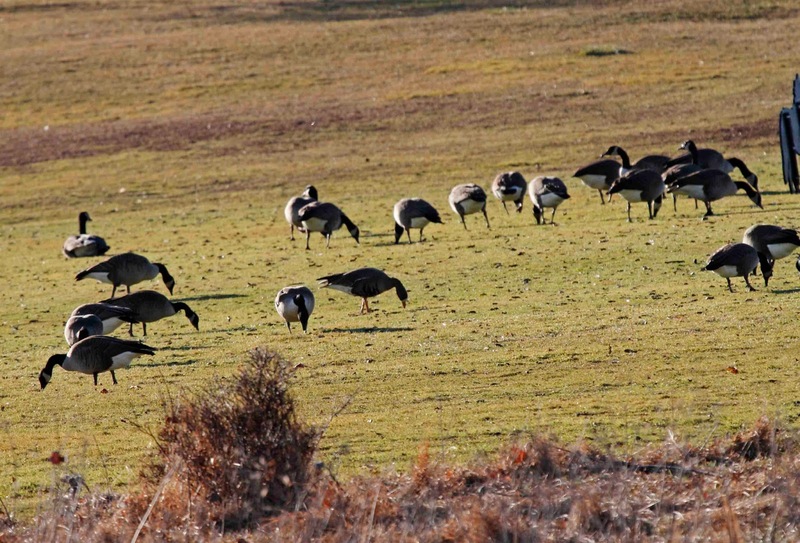 There are a few rare geese around the area this year, so I have to go see them. You know that the other contestants are going to see them, so I have to see them too. What a pain (it's only Jan 20th and already I'm typing "what a pain"). I planned this day around a hockey game in Bridgewater NJ to try to get one or more of the "weird" geese. 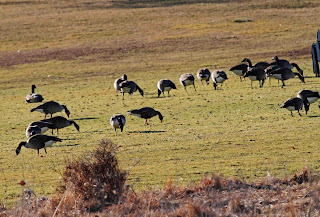 Greater White-fronted, Barnacle, Cackling and Pink-footed (which Lori and I saw in Nov but doesn't count unless I see one in 2013) are the weird geese that we were after. We didn't get any of them. In fact, there were barely any geese anywhere that we looked this morning. We drove around and around and only saw a few groups of geese. We did see some ducks and a Red-throated Loon on Lake Assunpink. After a few hours, we decided to go see the Northern Lapwings since Di and Barbara hadn't seen them yet and the light was so much better today. 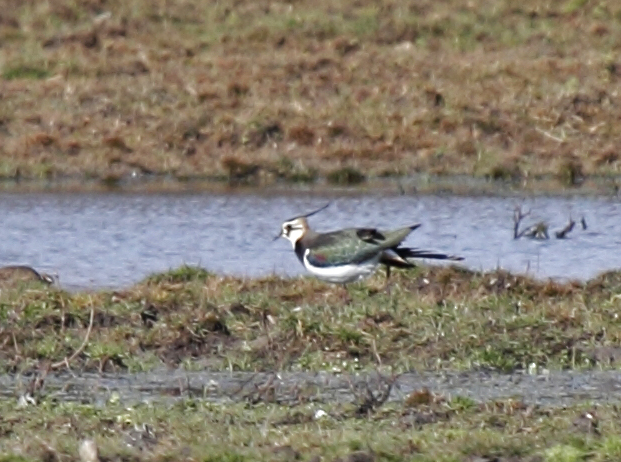 I'm glad that we saw the Lapwings again because the light really showed how iridescent they are. The birds were way in the back of the field as usual, so the photos are brighter but still grainy due to the distance. Here is a view showing how far away the birds were, but even more interesting was how they were not spooked by the cows. 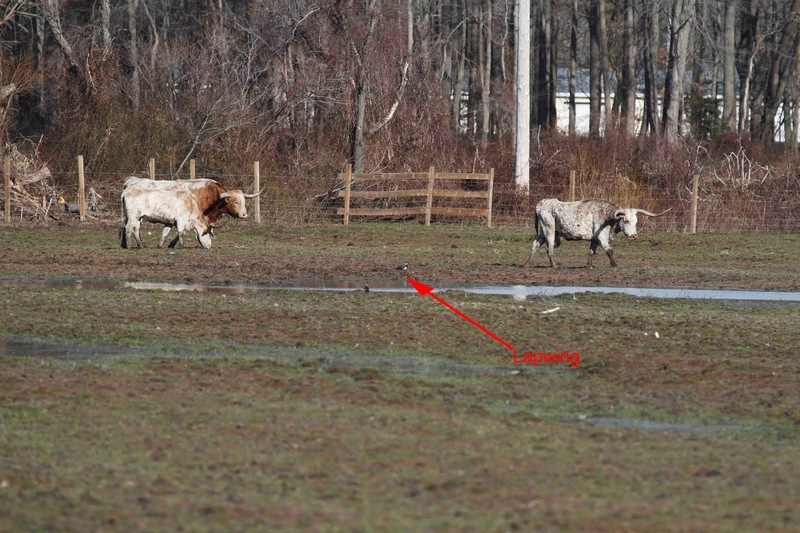 That big steer came pretty close to the Lapwing and that bird didn't budge. Di and Barbara gave up after this and I headed north for an hour to play hockey. We won 3-0. I didn't score but I had an assist which counts as a point on the score sheet. The bigger news is that I went to the Lyons VA Hospital grounds after the game which was about 15 minutes from the rink and got the Greater White-fronted Goose! I parked in the golf course parking lot (yes, the vets have a golf course) and started scanning the geese in the field. It took all of 3 minutes for me to find the odd ball. It was directly in front of me! The photo isn't great but you can clearly see that this is NOT a Canada goose.The Greater White-fronted is also a life bird for me, so a double win there. Of course, as I write this I am reading reports from other birders that they saw the Barnacle goose at Spruce Run Reservoir which I drove right past on my home because it was dark (aaarrggghhhh). You got your "life" bird today because you were nice to an old lady yesterday. Thank you. The lapwing looks exotic and gorgeous, love the green iridescence! Glad you got another look and a good photo.